Then the multitude rose up together against them; and the magistrates tore off their clothes and commanded them to be beaten with rods. And when they had laid many stripes on them, they threw them into prison, commanding the jailer to keep them securely. Having received such a charge, he put them into the inner prison and fastened their feet into the stocks. Acts 16:22-24. Charge, parangelia; Strong’s # 3852: a command or commandment received from a superior and transmitted to others. It can be in the form of a general order, instruction, command, precept, or direction. In out text it is used in way that makes the word self-explanatory. 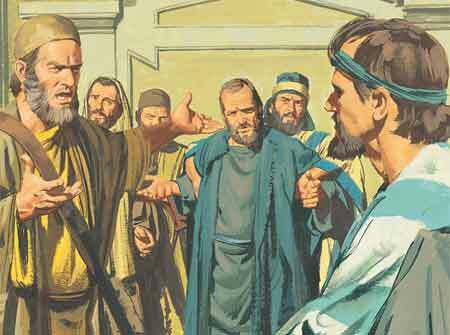 The prison authorities charge the jailer to imprison Paul and Silas. The Apostles were given a charge not to preach by the authorities of Jerusalem (5:8). Another example of parangelia is Paul’s charge to Timothy in 1 Timothy 1:5, 18. Happy Birthday to the State of Israel. Previous The Righteous God tests the Hearts and the most secret part of man. Next The Lord’s Mercies Are New Every Morning. Seems that it would fit well there. They all gave glory to God in their violent deaths and John did the same in his long life. I like your picture. It is wonderful that we have celebrated another year of the miraculous regathering of God’s people in Israel. Can’t wait to see the new Jerusalem. Thanks for another nugget my friend.